TheaterSeatStore is once again proud to announce a new exclusive event with Palliser Furniture - the arrival of a best in class space-saver called The Bullet. With the world of home theater experiencing a dramatic set back on the untimely announcement of Berkline's liquidation, the options to consumers in the short term will be constrained. The Berkline Tangiers was a industry leading space-saver with no real competition from the field. Now the Bullet offers all the same features and more. Features include a chaise style foot rest - missing in the Tangiers - with lighted cup holders and a burl wood black colored tray table. The base of the seat has ambient lighting for a true theater experience. Most importantly these lights are not daisy chained to the entire configuration like they would have been with Berkline (even though the Tangiers did not offer lighting - this type of connection existed on other Berkline models) which is a feature that has the ability to cause frustration. If one seat loses it's lighting then the entire chain is broken and all seats will lose the ambient lights. The Bullet is available in stock in most configurations and can be delivered in around 10 days. 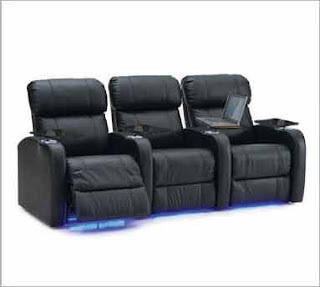 Material options include black or brown leather match, with power recline or manual. Of course this includes Palliser's industry leading warranty - limited lifetime on the frame and mechanism and 5 years on the padding - power is warranted for 2 years.